This Canada Goose chose an odd location for making its nest. It was in the middle of the parking lot at my former place of employment. The mother goose hissed and stood her ground to protect her eggs when anyone passed by too close. I’ve heard of geese attacking people so I stood back and used a telephoto lens for most of these images. The day the goslings hatched it was cool and windy. 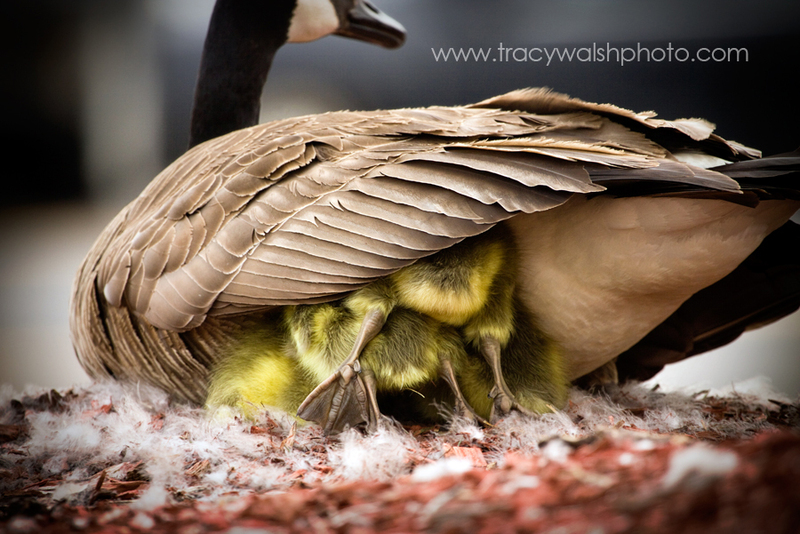 I caught my first glance of the fuzzy goslings when the mother moved just a bit to reposition herself. During a large wind gust the little yellow goslings all tried to keep their positions. They were even nudging each other to get in closer for a warmer spot. What a funny yet beautiful sight! Eventually the goslings started to emerge. I counted four of them. You could see one egg had yet to hatched. At first I was excited and thought I could catch a photo of the gosling breaking free from its shell. After returning with my camera a few hours later I could see that wasn’t going to happen. The mother kept poking the egg and rolling it around with her beak as if to speed the hatching process along. Nothing. She still stood guard. The mother goose paused, looked at the other goslings who where starting to explore around the nest. She watched over the un-hatched egg for a while longer. Not wanting to give up perhaps. Time to move on and find a new home. The gosling were hesitant, but the parents persisted. I was about ready to leave when another challenge presented itself. Turkeys! What a day in the parking lot! Thankfully, the turkeys ended up not being a problem. I continued to watch as one-by-one the goslings made their way down from the median and waddled off with their parents into the distance as a family for the first time. Life gives us all challenges (just like the geese) – on February 3rd 2012, on the due date of my son, I received a phone call that I was going to be laid off at my full time job. I couldn't believe it! I had been there for over 8 years and in one day I went from looking for daycare providers to looking for a new job. After a short discussion with my husband though, we decided that I would stay home with Evan for now so that I could be with him and continue to build my photography business. These days home with Evan are so valuable, his smile lights up my world and makes me so proud to be a Mom! Sweet little Evan was born in January, a month before his due date. I thank God that all is well with him and I’m looking forward to my very first Mother’s day as a new Mom! I’d like to dedicate this post to all the Mothers who don’t give up and won't give up - Moms who, like the Mother goose, want the very best for their young, Moms who try to keep their little ones warm and sheltered from the scary things in life and Moms who go through heartaches and challenges just to make it through the day. Happy Mother’s Day to you...you deserve so much!